Join Billabong and Innerlight this summer for Surf Camp! Whether you’ve never set foot on a board, or just want to sharpen your skills, Surf Camp is a fun and unique experience. You’ll walk away with a surf adventure you won’t forget! WHAT TO EXPECT Quality instruction from top-notch surf schools selected by Billabong Surfing etiquette, culture, training and techniques Ocean science such as info on waves, tides and marine biology No worries if the surf is flat we will have other fun games and activities for the participants A Surf Camp T-shirt, stickers, coupons, and other goodies WHAT TO BRING Boardshorts or swimsuit, a towel and lots of sunscreen A snack/lunch and something to drink Surfboards are provided by the camp Rashguard (Lycra top, to protect from a rash and sun) WHAT TIME IS SURF CAMP? 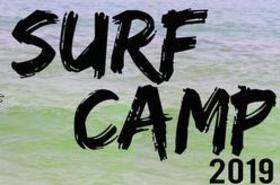 Surf Camp is from 9:00am to 1:00pm WHO CAN JOIN IN ON THE FUN? Participants must be at least 7 years old and a strong swimmer…we have had people from 7 – 78!